The art toy works of Quiccs are not pristine. In contrast to his immaculate digital illustrations, which stem from his professional calling as a graphic designer, his hand-painted sculptural pieces embrace the perfection of imperfection. Adorning his fluidly robotic geometric forms, the Filipino artist seemingly freehands many precise aspects, allowing brushstroke flairs and splattering to occasionally surface. And while the art toy works of Quiccs may not be pristine, they are deeply personal, embodying a self-styled aesthetic that the artist calls Bulletpunk. Initially conceived as a branding identity around 2011, Bulletpunk would begin evolving into its modern usage the following year when Quiccs dedicated himself to art toy creation. Already acquainted with this mode of sculptural expression through the works of Michael Lau, Quiccs challenged himself by entering and ultimately placing in the CE Contest II. Immediately inspired to pursue this path, the artist began assembling and modifying forms that resembled the Japanese robots he watched on TV in his youth, such as Mobile Suit Gundam and Armored Fleet Dairugger XV. But Bulletpunk didn’t fully coalesce until he created the central character for this “universe”, TEQ63. And while the name Bulletpunk was originally derived by merging two terms together, those of shoot ’em up “bullet hell” video games and science fiction’s lowlife-meets-high-tech “cyberpunk” subgenre, it would become synonymous with Quiccs’ style, as exemplified through the TEQ63 form. Serving as more than cohesive appearance for his works, this Bulletpunk aesthetic acts as a roadmap of Quiccs’ life prior to delving into designer toys. The TEQ63‘s robotic, mech-like head stems from the artist’s nostalgic memory of watching the likes of Chōdenji Machine Voltes V and Tōshō Daimos during his childhood in the ’80s. And it’s hoodie attire with sneaker accouterments denotes hip hop culture, which the artist became obsessed with during his rebellious teen years in the ’90s, as well as the graffiti scene he discovered in the 2000s through the work of 123klan. Even Quiccs’ stylized appropriation of the Jolly Roger is potentially inspired by his graphic design profession, one of his entry points to vector art being Machine 56, who employs a similar icon. In the end, Bulletpunk isn’t simply an aesthetic, it is a true representation of Quiccs’ journey. And, as such, nothing seems more appropriate for his Reinforcements Have Arrived solo exhibition than for it to be comprised solely of TEQ renditions. 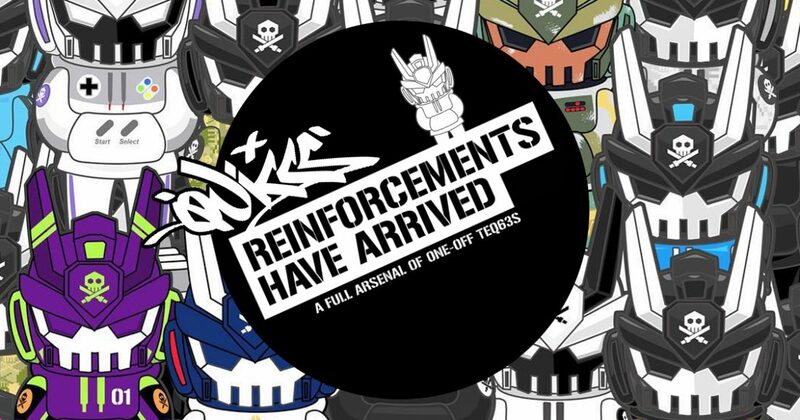 And while TEQ is an abbreviation of The Endgame Quest, or the final journey to be accomplished in certain video games, the Reinforcements Have Arrived exhibition reveals how Quiccs’ Bulletpunk exploration still evolves and strides forth. Not only in regards to the limitless options of altering others’ sculptures, such as Quiccs’ transformation of Huck Gee‘s massive robot form into the unique SKLFKR TEQ, but also in the personal narrative that the artist can imbue into these works. From the metallic purple and fluorescent green tones reminiscent of Neon Genesis Evangelion to the Star Wars-inspired BobaTEQ designs, from the Shining Gundam‘s gold “Super Mode” coloration to Bruce Lee‘s yellow tracksuit from Game of Death, Quiccs’ choices in decorating his various pieces within Reinforcements Have Arrived continue to explore the media that inspired him, his personal journey being that of looking backward as he continues forward. Quiccs’ Reinforcements Have Arrived solo exhibition at Clutter Magazine Gallery had its opening reception on Saturday, January 12th from 6-9pm, which included the artist conducting a live painting session. All works in this exhibition remained on display until February 1st, 2019 at the gallery’s physical location (163 Main Street, Beacon, NY 12508).